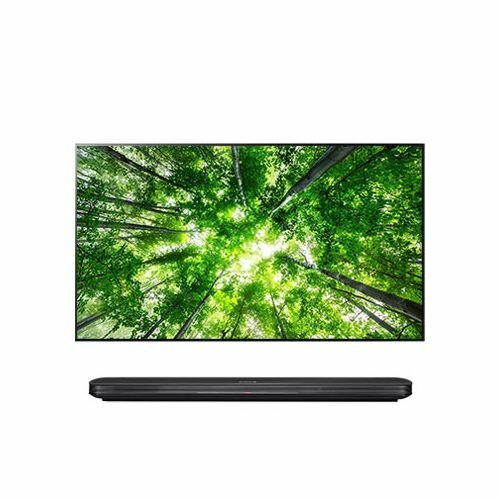 Achieve a picture-on-wall effect with the 0.23"-deep LG SIGNATURE W8PUA-Series 77"-Class HDR UHD Smart OLED TV. It has a 76.7" OLED display for enhanced black levels and virtually infinite contrast. The TV features a native UHD 3840 x 2160 resolution and will upscale lower-resolution video sources for near-4K quality for augmented clarity. 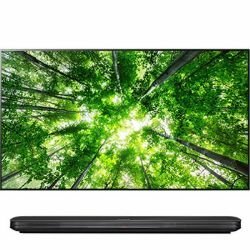 Being HDR10-, Dolby Vision-, and HLG-compatible, it can display a wider range of color with compatible content than non-HDR displays; it also supports the Advanced HDR format from USB-based content. The W8PUA includes a 2.0.2-channel, Dolby Atmos-enabled soundbar, which serves as a media center for your sources. It has four HDMI, three USB, composite video, and optical audio inputs, and outputs them to the display via the included TV-to-AV Box cable, which is required for the TV to function. The system has Wi-Fi and Ethernet built-in for smart TV capability, including AI ThinQ, the LG Content Store for apps, and a full web browser.